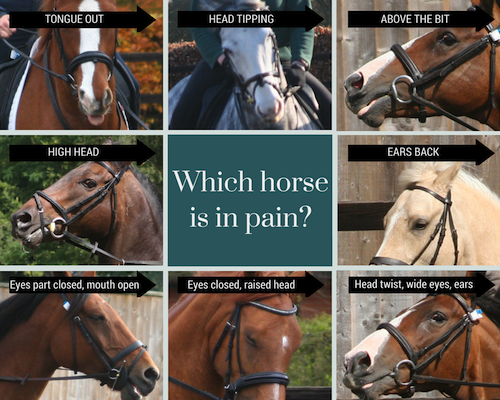 Researchers at the Animal Health Trust (AHT) Centre for Equine Studies in England have produced a practical tool to help owners, riders, and professionals recognize signs of pain by observing a horse’s facial expressions. The second part of the study was published recently, along with a new video, with a focus on facial expressions relationship to lameness. Both videos are included in this article. The premise for the system is that, unfortunately, owners and trainers do not recognize changes in a horse's facial expressions as signs that a horse is displaying that it is in pain. This means a horse’s health and welfare can be threatened, as veterinary assistance is not sought early enough -- if at all. The signs and system are explained in two short videos, totaling less than 20 minutes of the viewer's time. It's important that the entire video, particularly for part 2, be watched. The true gem occurs around nine minutes into part 2, when Dr Sue Dyson, Head of Clinical Orthopedics at the AHT, reveals her blind comparison of faces of sound and lame horses; she also mentions how nerve blocks were used in the study to mask lameness, and the horses' facial expression scores changed. what it could mean for both horses and humans in the future. 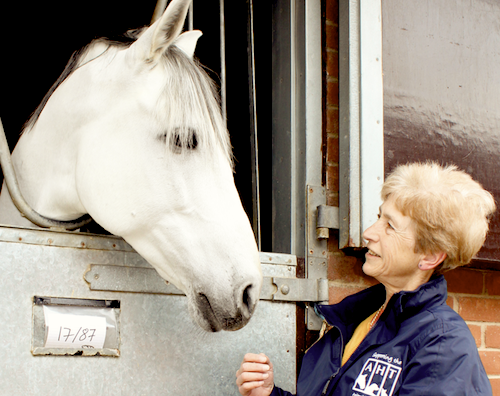 Dr. Sue Dyson evaluating a contented-looking horses at the Animal Health Trust in England. The first video has already ignited a lively debate online about equine behavior and body language. There have also been comments from owners who now feel guilty for not taking note of these facial expressions sooner to help their horses. Other professionals agree that these expressions can be recognized, but are amazed at how often they are not. whether or not the ethogram is effective in not only helping recognize signs of pain, but could also be used to differentiate a lame horse from a sound horse. There is undisputed evidence to show that owners, riders and trainers lack ability to recognize signs of pain seen when horses are ridden. As a result, problems are labelled as training-related, rider-related, behavioral, or deemed ‘normal’ for that horse because ‘that’s how he’s always gone’. Unfortunately that means pain-related problems are often disregarded, the horse continues in work, and the problem gets progressively worse. Recognition of changes in facial expression could potentially save horses from needless suffering and chronic injuries by enabling owners and trainers to perceive pain sooner, and get these horses the veterinary care that they need. Developing a practical tool for recognizing these facial expressions, similar to that of an equine body condition score chart, could dramatically improve the health and welfare of all horses. This is something Sue Dyson and her team at the Animal Health Trust continue to work toward. Video 1. 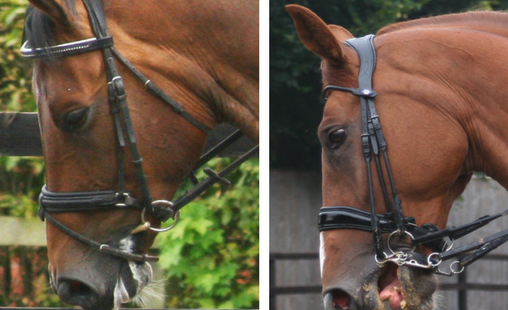 Facial Expressions Research - is your horse trying to tell you he's in pain? The ethogram is a catalogue of facial expressions including the ears, eyes, nose, muzzle, mouth and head position. Each body part can display an expression which may be normal, or reflect pain, conflict behavior or distress. In its first stage of testing, the ethogram was successfully applied by a variety of people from different backgrounds to a selection of photographs of horses’ heads while they were ridden. Using the ethogram, these individuals could identify different expressions in each horse, such as positions of the ears, changes in the eyes, and tightness in the muzzle. The results were highly repeatable among the analysts proving that, with guidance from the ethogram, owners could potentially reliably recognize different expressions in their horses' faces. Stage two tested if the ethogram could be used to distinguish between sound and lame horses. During this phase a pain score from 0 - 3 was applied to each of the facial expressions (mouth, eyes, ears etc. ), and then totaled to determine an overall pain score for each horse. Sue Dyson categorized 519 photos of horses to be lame or sound; these were assessed. An amazing total of 27,407 facial markers were recorded, with results showing that there was a scientifically significant difference in pain scores given by the assessor for clinically lame and sound horses. being severely above the bit. To further prove the effectiveness of assessing pain in a horse with the facial expressions ethogram, a selection of lame horses underwent lameness assessment and nerve blocking (using local anesthetic solution), to alleviate the pain causing them discomfort when ridden. Comparison of their facial expressions before and after using local analgesia showed a significantly lower pain score once the pain causing lameness had been removed. The complete research from the AHT's ethogram project was published in two parts in the Journal of Veterinary Behavior this spring. Access to the journal is limited to subscribers or to libraries with Elsevier journal contracts. The papers can also be purchased online for downloading. You can read the abstract pages of both papers for no charge. Can the presence of musculoskeletal pain be determined from the facial expressions of ridden horses (FEReq)? Thank you so much for sharing this study-I think this is fascinating and something I think about constantly when watching horses move. I appreciate the awareness that I hope this study will bring. Will the ethogram be available to the public soon? Hi Maureen, I think that the Dyson group's ethogram will continue to mature (evolve?) and there may be interesting developments within the welfare aspect, so this may be more of an evolution than a one-time publishing event. As for the two papers on it published so far, they are technically "available" to the public, but for a fee. I don't imagine that the Journal of Veterinary Behavior will allow free access anytime soon. However, Sue Dyson lectures widely and is very involved in horse owner awareness of lameness, so I would expect that we'll see more on this. You can also hunt for free-to-read versions of the paper posted by the authors on various sites and repositories or ask a librarian help you obtain a copy of the papers (or just purchase them from the publisher). There are many papers about the borader equine ethogram, if you have an interest in behavior--search for authors like Sue McDonnell and Paul McGreevy--but Sue Dyson's group specifically addressed the ridden horse. The annual proceedings of the International Society for Equitation Science is a good source, too. I hope that helps!